The Archdiocese of Denver approved the Society of Servant Pilgrims as an official Association of Christian Faith under Canon Law 298 in 2016. With the understanding that ‘love your neighbor as yourself’ is a directive for action, the underlying motive of a servant pilgrim is to go out and meet the neighbors of the world, and in so doing, build trust,which is the foundation of peace. The role of the Servant Pilgrim is to travel through the world, village to village, by foot in a demonstration of faith and with the daily effort to engage with people of the world,meeting them where and when they are encountered. The purpose of the Society of Servant Pilgrims is to encourage, support and engage people in spiritual pilgrimage around the world. The function is at two levels: as a place for like-minded servant pilgrims to congregate to share experiences and resources; and as a resource point for servant pilgrims to help other pilgrims on their pilgrimages. As a Catholic association, the importance of this bold effort is underscored and validated. The pilgrims may be Catholic, but the pilgrimage through different cultures and countries may well be ecumenical and interfaith. Because of the consuming dedication of a mendicant pilgrim, the pilgrim should [must] not be immediately responsible to other people’s lives; therefore, this is a category for single or widowed pilgrims without filial or parental commitments that would inhibit them from long and remote travel. Additionally, this is a category for pilgrims who have no possessions or other ties that would place burdens on their time or their inaccessibility. A mendicant pilgrim would travel on pilgrimage for part of the year and remain committed to helping pilgrims and speaking about pilgrimage during the other part of the year, while resting and preparing for the next pilgrimage. Ideally, during the part of the year not spent on pilgrimage, the pilgrim would live in community with other pilgrims or in association with lay or religious communities to benefit the spiritual needs that come with pilgrimage. They would attend Mass daily, recite morning and evening prayers, or whatever other means they would use to promote their [Catholic] spiritual life. A mendicant pilgrim travels solo rather than in pairs or groups for the safety and benefit of the host communities encountered. When a group of strangers approach a community – especially one small,isolated and unprotected – there can be immediate suspicion on the part of the community members. The mission of peace is instantly compromised. The inhabitants initially recoil from a group of strangers,particularly those speaking a foreign language among themselves, however well intended the group is; conversely, when an individual enters a community, there is little cause for alarm, and the inhabitants approach with gestures of openness and a general desire to learn, understand, and help. For safety and in fairness to the communities encountered along the way, the mendicant pilgrim strives to carry nothing of value. If a pilgrim brings something of value into the community – especially something that is not a necessity, such as cameras, phones, jewelry, and even money – and someone steals from the pilgrim, the sin is owned by the pilgrim – what sorrows awaits he who does the tempting. [No camera: The servant pilgrim is not on holiday, and one cannot photograph one’s own life. The moment spent taking a photo is the moment taken away from the present. If there are people in the photo, it may be an intrusion that presents suspicion and conflict. A photo only captures a distorted visual snapshot of a moment, not the full sensory experience – the scents, the sounds, the feels – humidity, heat, etc. – the animations. The memories of the experience shouldn’t be subject to a false record. Similarly,the intellectual burden of photographs – logging the data, time, place, dates, people… – has no place on a pilgrimage.] [No phone: Whom should the pilgrim call? Phones are something of value, which must be protected and charged regularly; they require either new sim cards every time a border is crossed or are very expensive to have full contract coverage… but why? If a person suggests calling ahead to the next night’s host, let the suggesting person make the call. If a mobile device is used as a computer to track the weather or check emails, stop and ask to use a computer if it’s so pressing. A phone for ‘emergencies’? God protects the pilgrims among us and He doesn’t need a mobile phone.] [No money: Money alters inter-human experiences – the one with the money is economically superior to the one without the money. Pilgrimage is no place for this hierarchy. The pilgrim ought to be the least among the crowd. A pilgrim wants for nothing. If someone genuinely asks how he can help, what a pilgrim needs, let the pilgrim say, I could use some toothpaste, or, I’ve torn my shirt and could use some thread to mend it, or more simply, some water, and be content with whatever is provided. ]In having no money, the pilgrim is not burdened with the need to protect it, or to obtain more, or how tospend it wisely. Without the burden of money, the pilgrim is compelled to ask for assistance every evening in order to sleep with security and to receive something to eat. Ask and you shall receive, seek and you shall find, knock and the door will be opened. This motivates the pilgrim to engage with the communities encountered, and motivates the pilgrim to reach a community by the end of each day. A silent pilgrim does the world no good. 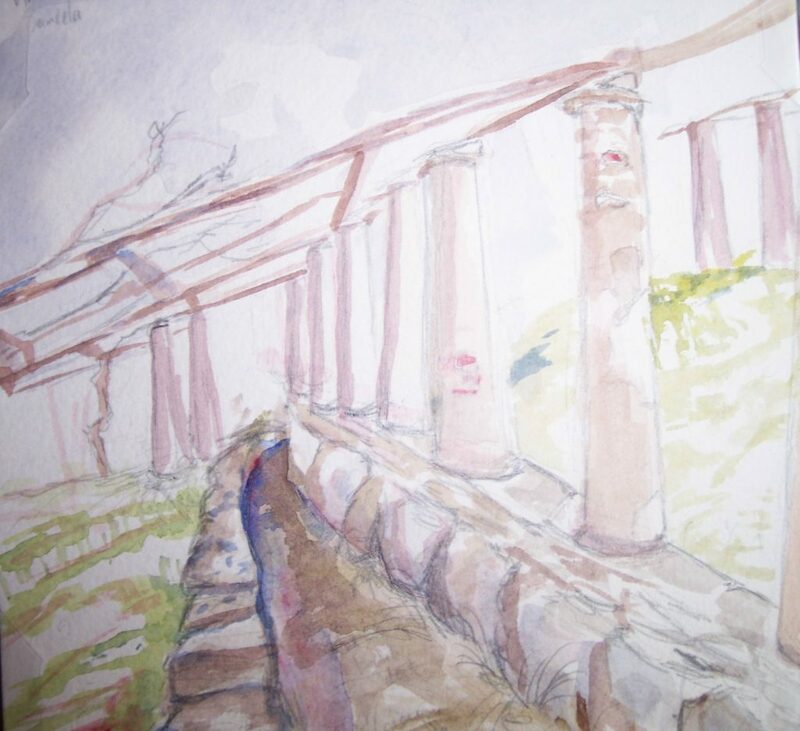 Even in crossing deserts, jungles, high mountains, thick forests,and plains, routes can be found where people are encountered in a day’s walk. [For practical purposes,the pilgrim traveling abroad could carry a credit card along with a passport, because typical entry requirements across an international border are proof of subsistence and means to return to residence.] As a tool to reassure communities of the trustworthiness of a pilgrim, pilgrims carry, by tradition,credentials… small bound books with the pilgrim’s personal information – name, nationality, age, destination, etc. – and validated by an authority, e.g., the Association’s sponsor Bishop or a home pastor.The pilgrim strives each night to have the new host sign and date the book, stamp if available, along with the location. As the pilgrim progresses, the host of any given night can review the book with each night written in a different hand, as assurance that the pilgrim is truthful with the path taken to that point. The credential, though not a legal national document, is helpful with military and other authorities invalidating the mission and identity of the pilgrim.The mendicant pilgrim strives to walk every day along a path of cultural, historical and/or religious significance toward a destination of religious significance. People of all cultures are inclined to assist a pilgrim going to a worthy and known destination, even if the destination is not one that person would himself go to. By choosing (or being inspired to go to) a religious shrine, the pilgrim becomes an ambassador of sorts and spreads the significance of the shrine to an unknowing audience.As a practice of spiritual discipline, the mendicant pilgrim would carry a Bible and if not a breviary, at least a summary of the psalms, canticles, and readings of the four-week cycle to enable participation in the morning and evening prayers alone or with the various communities encountered. The mendicant pilgrim should attend Mass or other Christian service daily or when available. It is widely understood that a pilgrim’s duty is to carry prayer intentions of Christians met along the way to the sacred destination. Not all pilgrims are comfortable enough to go out on pilgrimage alone, with an expressed mission of peace. The entry level for spiritual foot pilgrims is often inhibited by finding the path and finding the accommodations every night. Companion pilgrims are recognized as those pilgrims in small groups who travel by foot to significant, generally well known destinations, led by an experienced pilgrim or pilgrim guidebook. The Society of Servant Pilgrims serves as a central point for pilgrims looking for guidance and those entities who provide services to lead pilgrims. In some cases, servant pilgrims can support small groups of pilgrims, directly or indirectly; however, the association is not a tourist agency, and not a business entity and would not carry insurances and certification training often necessary to lead organized groups. 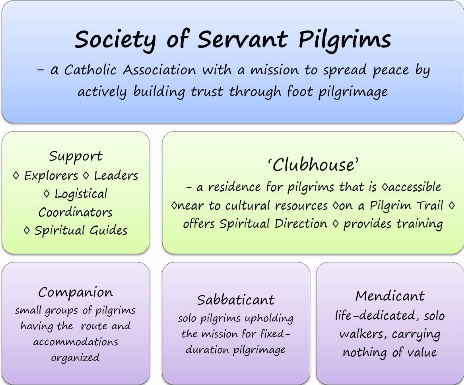 Typical services provided by the Society of Servant Pilgrims include assisting with identifying and exploring potential pilgrim trails, developing or helping develop guidebooks to pilgrim destinations, assisting in the logistical coordination for small groups to walk along pilgrim trails in prearranging accommodations, for example, recommending pilgrim trails, or uniting groups with leaders. prepare for their upcoming pilgrimages. A central location where servant pilgrims could congregate would facilitate shared values, exchange of experiences, and thus deepen spirituality, as well as serve as a resource center.